Advantage Advertising, a Lewiston advertising agency owned by Charles M. Christopher has acquired Digital Barn Productions. Digital Barn and Advantage will continue to operate independently under their current names although the production house becomes a wholly owned subsidiary of the advertising agency as a result of the sale. 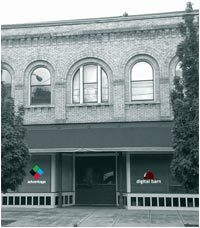 Digital Barn was founded in 1993 in San Jose, California’s Silicon Valley area and then moved to Lewiston in 2000. They expanded in 2006 when they purchased Dan Walker Productions in Lewiston. Both Dallas and Bobri Roberts and Christopher Billow, a Web and Production Coordinator, have joined the staff of six currently employed at Advantage. The new 1600 square foot space on the ground floor of the Means Building has been custom remodeled to include a video production studio, two video editing suites, an audio recording booth, a conference room, break room, a lobby and offices for all current employees as well as room for several new hires. In addition to the new video, audio, photography and web capabilities made possible by the acquisition, Advantage will continue to provide strategic planning, budgeting, media buying and placement, creative concept development, copywriting, graphic design, digital advertising execution, and social media management to its clients.